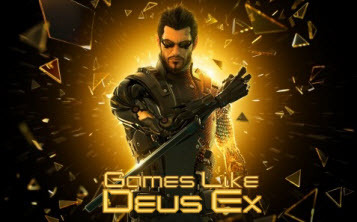 Games Like Deus Ex '+g+"
Deus Ex is a series of first-person shooter, cyberpunk-themed action role-playing video games.The story revolves around a bio-mechanically modified superhuman employed by the United Nations Anti-Terrorist Coalition, and take place in a dystopian near future. If you are a fan of cyberpunk-themed action role-playing games like Deus Ex and looking for more games with similar gameplay then find the recommendations for it below and don't forget to mention if we miss any games as we keep on updating this list. System Shock 2 is an action role-playing survival horror video game for Microsoft Windows. The game takes place on board a starship in a cyberpunk depiction of 2114. The player assumes the role of a lone soldier trying to stem the outbreak of a genetic infection that has devastated the ship. Vampire: The Masquerade - Bloodlines is a action role-playing game developed by Troika Games and released by Activision. The storyline of the game is dynamic with numerous optional quests and several different endings. Beginning the journey as a new Kindred the player can choose the path to follow either high class Vampire Society, or the lawbreaking group of Anarchs. Mass Effect is a series of science fiction action role-playing third person shooter video games developed by the Canadian company BioWare and released for the Xbox 360, PlayStation 3 and Microsoft Windows, with the third installment also released on the Wii U.The series has been a major critical and financial success. All three games have received critical acclaim for their storyline, characters, romances, voice acting, choices and the depth of the galaxy. Watch Dogs,.....if you can think of more, then don't forget to mention it in comments.